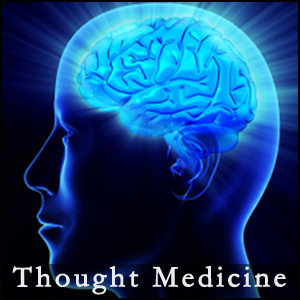 I believe that “Thought Medicine” is an excellent term (or reference) to a rapidly growing movement in the holistic, medical and scientific communities that recognize illness and disease as simply an imbalance in energy caused by negative thoughts, beliefs and emotions. It is already well known that many illnesses are greatly effected by many factors other than prescription drugs. These include: meditation, proper nutrition, stress management, exercise, refreshing sleep, hydration and many other variations specific to overall good mental and physical health. When the mind is sluggish, either anxiously or in depression, the immune system is compromised. However, we have all seen this easily reversed. For instance, positive thoughts that blossom from the famous placebo effect, as well as countless spontaneous remissions that occur throughout the world. Thought Medicine is about taking complete responsibility for your own health and well being, regardless of how you got there in the first place. This includes removing all blame from the external and focusing on how to improve from an internal perspective. It is about empowering yourself at the most basic and vital levels. Believe it or not, we have complete control over our health and well being. Sciences such as Epigenetics, Quantum Physics and Ayurveda suggest and support this fact on many levels. To engage in Thought Medicine, one has to open his/her mind to new possibilities and understand that the only limitations that exist are the ones that we allow to remain in our lives. So take time to educate yourself on multiple levels, include subjects listed in this website in your self-study, no matter how foreign they may seem to you. Once you gain a basic understanding of how your body works and how your thoughts are involved in that process, you will start to shed the unwanted imbalances and then disease and illness generally will give way to a much healthier state of being. Below are websites, articles & videos that are in line with this philosophy “Thought Medicine”. Please enjoy.